The Raptor was developed through the Advanced Tactical Fighter program, which was initially requested by the Air Force in the 1970s to produce conceptual designs of an air-to-ground fighter to complement the air-to-air F-15 Eagle.The Air Force needed the F-22 as a solution to emerging threats of the Soviet Su-27 Flanker, MiG 29 Fulcrum and the Chinese Shenyang J-11 multi-role fighter aircraft, to maintain air superiority after the Cold War and into the future. ENLARGE 📷Lt. Col. James Hecker flies over Fort Monroe before delivering the first operational F/A-22 Raptor to its permanent home at Langley Air Force Base, Va., on May 12, 2005. This is the first of 26 Raptors to be delivered to the 27th Fighter Squadron. The Raptor program is managed by the F/A-22 System Program Office at Wright-Patterson AFB, Ohio. Colonel Hecker is the squadron's commander. Thus, the request was amended with the advancements in stealth technology and the ATF program was then charged with creating a fighter with the capabilities of speed, agility, electronic warfare and signal intelligence into a stealth airframe which could also provide precision long-rage air-to-air and air-to-ground weaponry.The Air Force selected the two proposals of contract teams Lockheed/Boeing/General Dynamics and Northrop/McDonnell Douglas, to produce prototypes for flight testing, the YF-22 and the YF-23. 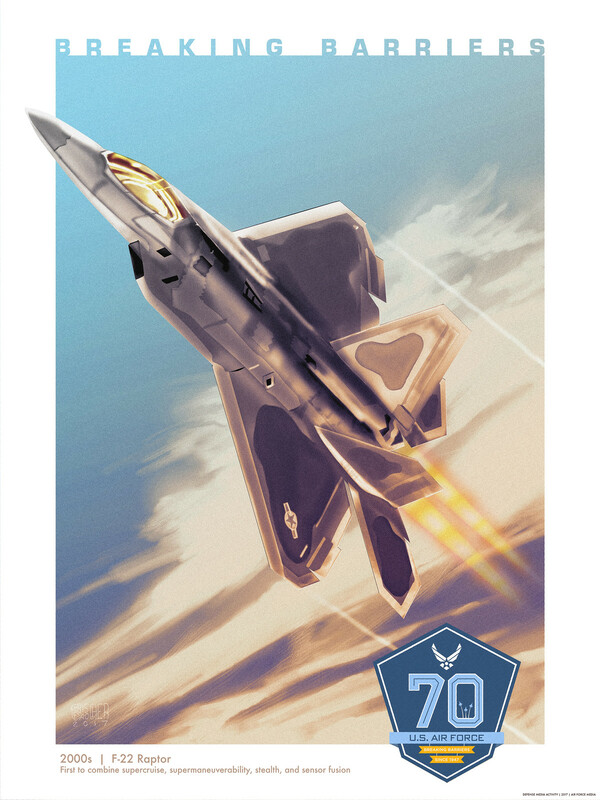 The Lockheed YF-22 was ultimately selected in 1991 with the first F-22A being delivered for flight testing in 1997. The Raptor is equipped with two Pratt & Whitney F119-PW-100 afterburning turbofan engines producing 35,000 pounds of thrust each, more than any current fighter. The jet is capable of Mach 1.82 during supercruise, or sustained supersonic flight without afterburners, and able to reach speeds over Mach 2 with afterburners.In the air-to-air configuration the Raptor carries six AIM-120 AMRAAMs and two AIM-9 Sidewinders. The Raptor also has an internally mounted M61A Vulcan 20 mm-rotary canon embedded inside the right wing.The Raptor’s ability to collect and share tactical information with legacy aircraft enables U.S. and allied forces to engage targets with unmatched battlespace awareness. With the data processed with the Raptor’s advanced avionics sensors and radars, the aircraft can even designate targets for allies. ENLARGE 📷A 1st Fighter Wing's F-22 Raptor from Joint Base Langley-Eustis, Va. pulls into position to accept fuel from a KC-135 Stratotanker with the 756th Air Refueling Squadron, Joint Base Andrews Naval Air Facility, Md. off the east coast on May 10, 2012. The radar emissions of the F-22 can also be focused to overload enemy sensors as an electronic-attack capability.During the F-22’s first Operational Readiness Inspection the aircraft was rated excellent in all categories with a 221-0 kill ratio against opposing aircraft.The F-22 has a significant capability to attack surface targets from high cruise speeds and altitudes. In the air-to-ground configuration the aircraft can carry two 1,000-pound GBU-32 Joint Direct Attack Munitions internally.The Raptor has the ability to deploy 1,000-pound bombs from 50,000 feet while cruising at Mach 1.5, and can strike a moving target 24 miles away. The first overseas deployment of F-22s was to Kadena Air Base, Japan in February 2007.F-22s participated in combat sorties for the first time during Operation Inherent Resolve, dropping 1,000-pound GPS-guided bombs on Islamic State of Iraq and Syria targets during the American-led intervention in Syria.From September 2014 to July 2015, F-22s flew 204 sorties, dropping 270 bombs on 60 different locations.On June 23, 2015, two F-22s performed the aircraft’s first close air support mission conducting airstrikes protecting friendly forces in Syria.